John D. Mayer, Ph.D., Peter Salovey, Ph.D., & David R. Caruso, Ph.D.
An ability-based measure of emotional intelligence. 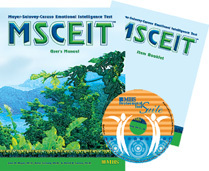 The MSCEIT™ test uses a variety of interesting and creative tasks to measure a person’s capacity for reasoning with emotional information. This makes the MSCEIT™ test ideal for situations where respondents may want to create a positive impression. The MSCEIT is suitable for all kinds of corporate, educational, research, and therapeutic settings. Personal Summary Reports present scores graphically and numerically, along with scale descriptions and a summary of responses. Resource Reports are designed as a very thorough and easily understood feedback tool for use with respondents. .